There were two severe earthquakes off the coast of Gisborne in March and May 1947, each generating large tsunamis in the surrounding area. The March tsunami was one of the largest tsunami in New Zealand's historical record. Run-up for Gisborne tsunami, 25 March. 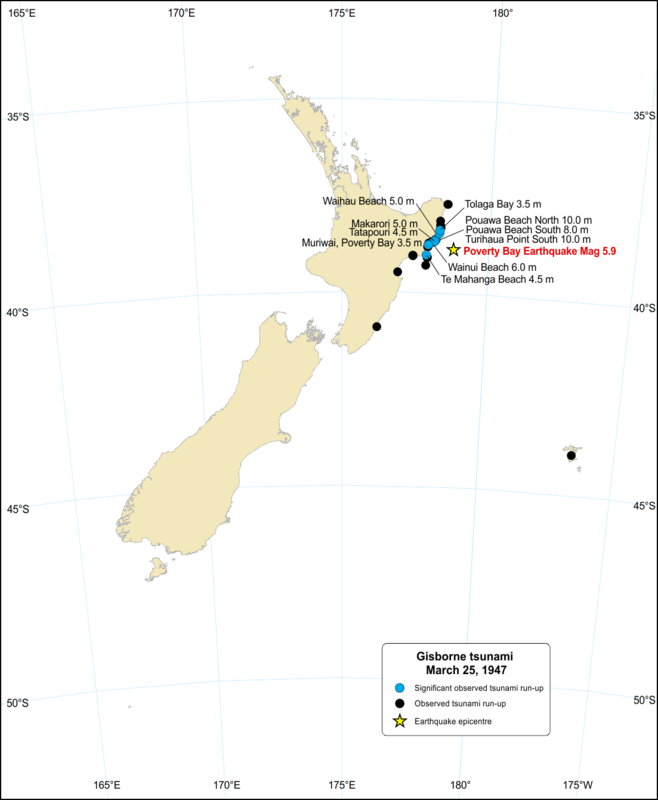 The MW 7.0-7.1 earthquake that occurred offshore Poverty Bay on 26 March 1947, 8:32 am (NZST) was identified as a "tsunami earthquake" and generated one of the largest tsunami in New Zealand’s historical record. Although the earthquake itself caused no damage, the tsunami caused damage to beachside cottages and buildings, bridges, fences and roads. The tsunami was observed along 115km of coastline from Mahia Peninsula to Tokomaru Bay, probably at Waitangi, and possibly at Tuapeka, in the Chatham Islands. The tsunami occurred less than half an hour before high tide (at Gisborne), which was about the level of mean high water spring tide, and hence its effects were at their maximum. At Tatapouri Point, Pouawa and the south side of Turihaua Point, where the tsunami was most pronounced, large breaking waves said to be 10-13m high were observed offshore. At the northern end of Pouawa Beach, where seaweed was found 12m above sea-level in telegraph wires well inland from the beach, and the decking and superstructure of a 16m span wooden bridge across the Pouawa River was swept about 800m inland, indicate a water height at the maximum inundation limit of about 10m. At the southern end of the beach, where the water height at the maximum inundation limit was possibly 6-8m, three rooms of a 4-roomed cottage were demolished and the building swept from its foundation. Five people in the cottage survived the tsunami, three trapped within the one room that remained intact, and two by running inland when the first wave was observed.